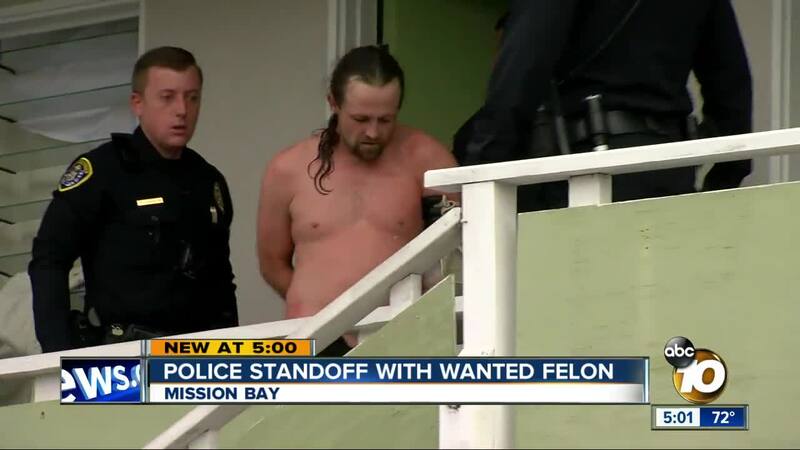 SAN DIEGO (KGTV) -- A man is in custody after a chase ended in a standoff with police at a Mission Bay Motel Sunday morning. Police say the chase started just before 9 a.m. at the A-1 Storage on Garnett Avenue after officers received a citizens' tip. The suspect driving a U-Haul truck led police on a short chase to the 4300 block of Mission Bay Drive near Roadway in San Diego. According to police, the man is wanted on felony weapons charges. After the chase ended, a woman in the passenger seat was detained while the driver ran into the nearby motel. The woman was later released. While searching for the suspect throughout the motel, officers learned that the man broke through several walls to try and escape. “This guy starts forcing himself into apartments, and now we have to deal with a possible hostage situation. That’s the reason why we brought so many resources down here. We wanted to get this guy into custody as fast as we can," Lt. Christian Sharp with the San Diego Police Department said. Eventually, police had to use chemical gas and a K-9 to apprehend the suspect, who has yet to be identified.